The Enviro EF3 pellet stove is the slightly bigger brother of the EF2 with a more powerful igniter and greater heat output through a double row heat exchanger. The bay window design provides a good view of the fire..
First produced in 1991, the Enviro EF3 is good value and has stood the test of time. This stove is simple and easy to maintain. It has a long burn time on the low heat setting. Standard features are gold louvres, and a brick effect firebox liner. Burn time Over 55 hrs. Window Size 19 in. by 8 in. Rear Vent Height 16.4 in. Limited Two Year Warranty: Ignitor, Auger Motor, Circuit Board, Timers, Temperature Sensors, Blowers, Vacuum Switch and Wire Harness. An inexpensive, reliable stove with a good heat output. Inside the firebox, ash may be removed from behind the steel plates by rotating the circular cover to allow vacuuming behind the plates. Operate the heat exchanger cleaning rod. Check the door gaskets, re-glue if necessary. Check and clean fly ash from the stove's exhaust passageways. Remove the firebox backing and clean the back of the stove. Check and clean the exhaust flue every year or after burning two tons of pellets. Vacuum dust from the blowers and lubricate the convection blower. 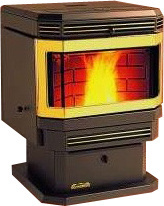 If you would like to leave a review of the Enviro EF3 pellet stove, please use the form on the contact page.